Genetic Algorithms (GAs) are one of several techniques in the family of Evolutionary Algorithms - algorithms that search for solutions to optimization problems by "evolving" better and better solutions. 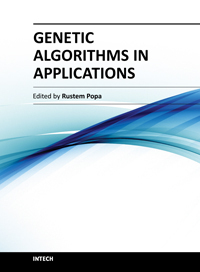 Genetic Algorithms have been applied in science, engineering, business and social sciences. This book consists of 16 chapters organized into five sections. The first section deals with some applications in automatic control, the second section contains several applications in scheduling of resources, and the third section introduces some applications in electrical and electronics engineering. The next section illustrates some examples of character recognition and multi-criteria classification, and the last one deals with trading systems. These evolutionary techniques may be useful to engineers and scientists in various fields of specialization, who need some optimization techniques in their work and who may be using Genetic Algorithms in their applications for the first time. These applications may be useful to many other people who are getting familiar with the subject of Genetic Algorithms.